In two weeks, I will complete my first summer internship. Although an internship is primarily sought out for experience, I have learned much more about the real world than how to put difficult equations to practice (engineer, here). My internship search actually began two years ago, as a Sophomore in college. I attended the career fairs that I was always advised to, and flirted with numerous recruiters from various companies. I had minimal luck, but ended up scoring an interview with an aerospace firm close to home. I really wanted this internship, so I prepared diligently for the interview, not thinking to apply to other engineering firms online. After receiving a second interview, I was unfortunately notified that I had not been chosen. Last year, I took a different approach to the internship hunt. I decided to attend the career fairs as before, but also applying to as many programs online as possible. This is my biggest piece of advice: apply, apply, apply. 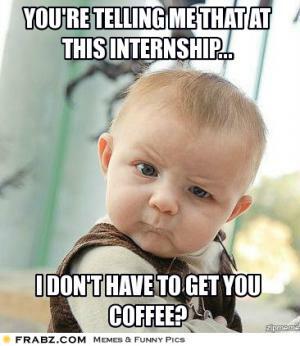 For every hundred internships you apply for, you may only score one interview. It seems like overkill, but that is what it takes. Don’t put all your eggs in one basket like i did two years ago. After weeks of filling out applications and a handful of interviews, I finally received two offers for the summer. Despite this great news, I was in a predicament. While one company had a more prestigious name, the work was more business-like and less technical. The other company was much smaller, but promised exciting technical projects. In the end, I chose the latter option, and couldn’t have been more pleased. This summer, I contributed to a real assignment that a customer will see. I was able to to apply skills I have learned in college (microprocessor operation) and learn new ones in the process (script programming). At the end of the summer, I will present my findings in front of my fellow interns as well as the CEO and President of the company. Aside from the technical experience I’ve gained, I’ve also learned a lot about corporate culture at the company I work for. Due to its size, the company is more connected to its employees, providing them with special benefits and family concern. Employees also enjoy company-sponsored events, such as picnics and holiday celebrations. Although I am unsure about my final career plans, I do know for sure that I would prefer a smaller firm over a large one. Finally, I have learned what it means to live in a new place, starting anew with a blank slate. I was unfamiliar with the city, so on the weekends I explored new restaurants, parks, and coffee shops. I started with no friends, so I chose to spend time with my fellow interns. I even started playing Ultimate Frisbee (I was a little late in the game), meeting friends there. All in all, my internship experience was golden. I accomplished my primary goal: to learn something. And on the way, I just happened to meet some amazing people that I can call friends. My name is Andrew Mortellaro and I am an Electrical Engineering student at the University of Florida. Previous Previous post: I love people, wait what was the question? Next Next post: Do you hire crazy? Yes, yes we do.